Moira Cue is reading and reviewing, in random order, every Pulitzer Prize winning novel ever written. The treatment of childhood, in literary history, changed dramatically during the twentieth century, from being either ignored or told from an adult, omniscient view, to a more realistic approach in which the child’s point of view stands in direct contrast to how we as adults contextualize our narrative, due to the obvious limitations of a youth’s vantage and comprehension. Of all the experiences adults and children process differently, death, particularly the death of a loved one, is one of the experiences of great magnitude which challenges very young children’s comprehension. While an adult may go into shock and feel nothing for a short period of time, the grief that an adult feels is considered “whole.” Very young children who live very much moment to moment, don’t really understand the finality of death. 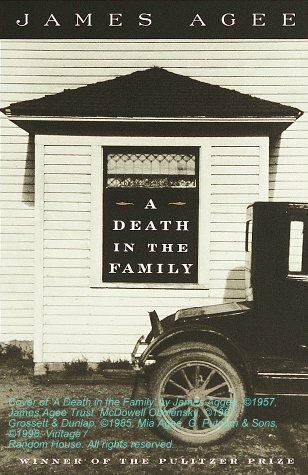 In Jame’s Agee’s novel, “A Death in the Family,” the narrative switches effortlessly between adult and child family members. The six years old boy, Rufus, who biographers and critics say is autobiographically based, is at the heart of the story. Ironically, James Agee died before the novel was published, suddenly, of a heart attack at age 46. He won the Pulitzer Prize posthumously, for this novel, in 1957. The version of the story which was published inserts unconnected but related material; floating dream sequences and memories that don’t tie in directly to the otherwise very chronologically progressive narrative, into several seemingly arbitrary insertion points, in italics. Aside from these digressions, which at best add another layer of mystery and complexity, the novel progresses to cover a very short period of time in which Rufus’s life changed forever. The story begins with a brief portrait of Rufus’s happy home life including walks home from the theatre with his father Jay, after catching the part of a Charlie Chaplain movie that they had missed, descriptions of the men in the neighborhood all watering the lawns at the same time of the evening, and summer nights spent on blankets listening to the crickets and his father and mother singing “Sweet Chariot” with alternate melodies. The closeness between Jay and his wife Mary includes moments of tenderness as well as teasing. Jay talks about Charlie Chaplain, for example, just to get a rise out of Mary, who squeals and calls him “disgusting,” as much of his physical comedy involves using his cane to attempt to lift women’s skirts. In another scene, Jay is shown singing and rocking Rufus much longer than necessary, out of tenderness and love. The action quickens with a telephone call in the middle of the night. Jay’s brother, Ralph, calls in a drunken stupor. Jay’s father, who has a heart condition, has experienced another attack. Ralph insists that Jay come to see him on what may be his deathbed. Jay, at first, wonders if Ralph is exaggerating, considering Ralph’s condition, and then feels guilty for trying to second guess his father’s health and decides that he needs to leave immediately. He promises Mary he will be home before nightfall. She cooks him a large breakfast, they gaze at each other, and he warms milk for her to drink to help her get back to sleep. Little does Mary realize, she will never see Jay again. While Jay’s father survives, Jay is killed in a freak automobile accident on his way back to his home in Knoxville. A stranger calls late the next night, after the children have gone to bed, and asks Mary to send a male relative saying only that her husband has had an accident just down the road. She asks her brother Andrew to go. Hoping for the best, she prepares the bed for Jay, in case he needs to come home to recover. At this point the story slows down, just as horrible things sometimes seem to happen in slow motion. Every nuance of the family’s realization is rendered precisely, in great detail, without judgment. While some family members cling to God, others feel nothing but outwardly suppressed rage toward religion in general and its adherents in particular. The children don’t know what is going on. Rufus is surprised that he is excused from school, and seeing the older boys who normally tease him, he blurts out that he is not going to school because his Daddy is dead. The other boys treat him with newfound awe and respect, even though it is a totally inappropriate thing to brag about, for an adult, for a child it is a common reaction, a sort of “reality testing” typical of the developmental stage he is in as a six year old. As the author’s own father died when the author was six, one can only suppose that his awareness of, and sensitivity to, human psychology was heightened by this event. In the end, the uncle, Andrew, who was asked to identify the body, who is a nonbeliever, experiences a moment of transcendence during the funeral in which he is able to suspend his disbelief in any existence beyond the mortal realm. This small symbol of hope is presented as both ordinary and miraculous, depending on the reader’s bias, open to any one of several interpretations.